Hey there everybody! Welcome to another edition of Jack’s Chat. Most of you may know that we are back in the U.S.A., and have finished our time in Latin America. Since I last put out a Jack’s Chat post, we have made out way through Bolivia, Argentina, Brazil, and Uruguay. 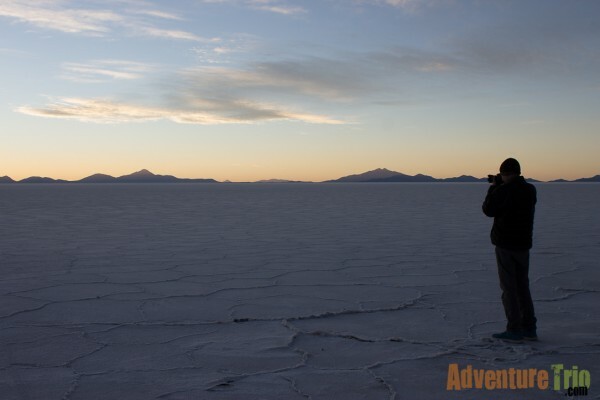 After out visit from La Paz and following down the western side of Bolivia, we made our way south to the Uyuni Salt Flats, of which was breathtaking! If you ever are thinking of traveling to the salt flats, remember to bring sun glasses, the salt reflects the sunlight like snow. 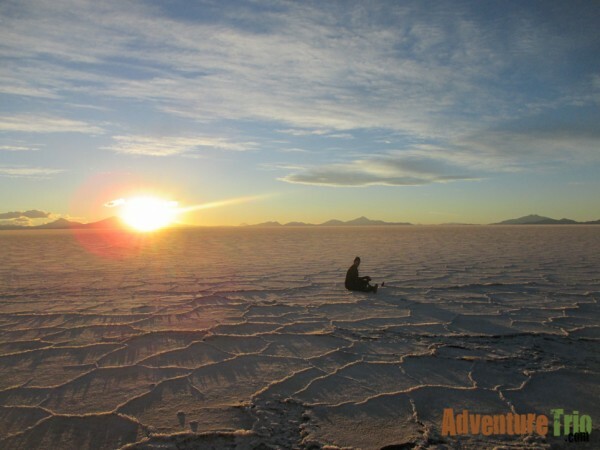 We did end up staying some nights in Uyuni, (the town that in on the edge of the salt flats) and then made our way out to camp one night on the edge of an island on the salt. That night, the temperature had to be -13 degrees Fahrenheit. 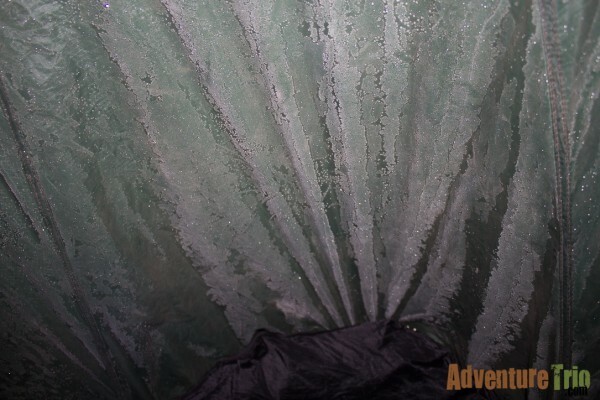 We woke throughout the night to use the bathroom and noticed that there was frost on the inside of the tent. I’m not kidding, the inside of the outer shell had frost! That was one of the few nights where my parents and I all slept in the same tent. After our time on the salt flats, we made our way south towards Tarija. On our way into town we stopped in the main plaza and started looking for a hotel. As we were looking a man came up to us and said that he knows of a hotel that is very nice and is priced very well. We followed him to this hotel and he wasn’t lying. The hotel that he had in mind was indeed very nice, for a price within our budget. Once we got settled in we went out to get some dinner, and saw some other BMW motorcycle riders that looked like they were returning from a trip. We asked them where they were from and where they were heading. It turns out they had just gotten back from a week trip out to the salt flats. We kept talking and we told them about our trip and they were very interested and wanted to talk a lot about what we were doing. We exchanged phone numbers and the next day we got a phone call asking us If we wanted to come to one of their houses for a barbecue dinner, and to bring our bikes to show them our kit. We gladly said yes and that night we met up with one of the guys at our hotel and he said, “I don’t have my bike with me, I will grab a cab and you will follow me there.” We proceeded to ask him if he just wanted to hop on the back of my mom’s bike, and he very excitedly said yes. He guided my mom to his friends’ house towards the edge of town, and we pulled into a very nice neighborhood and pulled into the driveway, of which there were 3 more BMW motorcycles. We walked into this very nice house where we were greeted with wine and the smell of a very good barbecue. That night we spent about 3-4 hours just talking and showing photos and videos of where we have been, and all of the people there were just amazed that we had ridden through Mexico and Central America and we still had more to go. 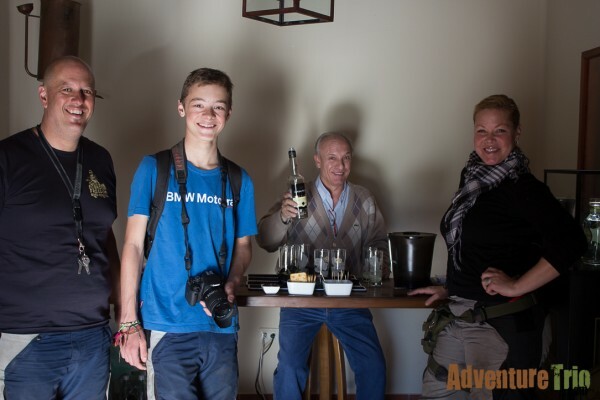 We ended up staying almost 10 days in the town of Tarija due to one of the people taking us on a private tour of a plant for a drink called Singani. It is only made in Tarija Bolivia and is hard to come by outside of the country. Our tour guide was the production manager at the plant. We enjoyed our time there but It was time to move on. The day we left we also crossed into Argentina. The town we stopped to stay in was a medium sized town, but there wasn’t a lot that was going on. We did find a hotel that had the coolest elevators ever! If you could imagine the elevators from Harry Potter, those are what we had. Once we left that town we went south to try and meet up with a family who have been traveling for 3 years in a sportsmobile like van, with their 6 year old son. We stayed with them in the same campground and then traveled together for the next 3 days. We started making our way towards Salta Argentina, and by then we had split from them with hoped of meeting up again in Brazil. Hello everybody and welcome back to another edition of Jack’s Chat. We have been in Peru for about 3 weeks, and we have been having a great time. We have been with our friends Mirko and Claudia from Germany (also on motorcycles) who are doing a similar route as us. 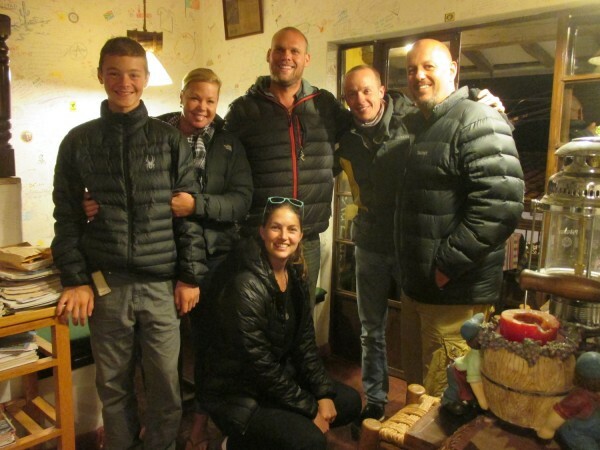 We met them at Horizons Unlimited 2014 and met up again in Cuenca, Ecuador. Once we crossed into Peru, we immediately headed to the coast. We rolled into the town of Pimentel in the middle of what appeared to look like Afghanistan. Once we got out of the mountains, it was complete desert. We stayed along the coast for a while going through Trujillo and some other little towns before heading back into the mountains, landing in a really cool little town called Santiago de Chuco. We made our way through the mountains going through little villages with houses made of mud bricks and plastic roofs. 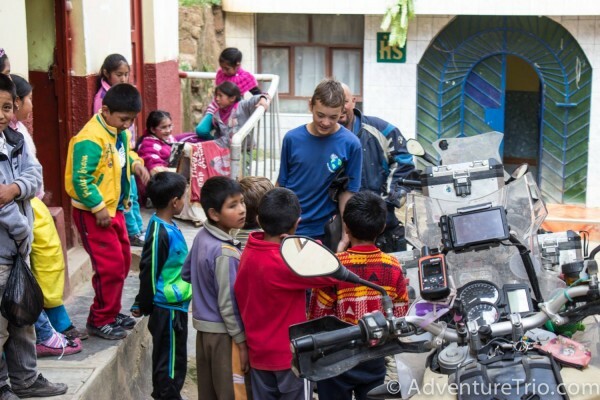 As we pulled into one town, we were immediately surrounded by kids from the local school asking questions and pointing at things on the bikes. Once we got everything off the bikes, we were able to park the bikes inside the parking lot of the nearby church with permission from the priest. That night, we met a kid who seemed very shy around us. We bought him a little snack that came with a little toy truck, and then he followed us around the whole plaza. He ended up poking his head into our hotel, and we invited him in. We sat and showed some pictures from early in the trip, and he just sat there and smiled. We offered him some of the food that we had made, and we all sat and ate. We started talking about what he is going to say to his parents when he goes home and he says, “I’m not hungry. 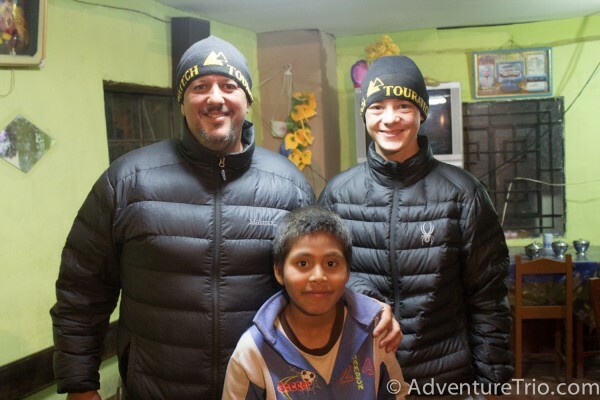 The friendly gringo’s fed me.” Once we all finished eating, he walked home and we made our way back into our little rooms for the night. We woke up the next morning to the same group of kids outside waiting to see the bikes again. We got the bikes out of the church and rode up to a restaurant were I got a table. As I took off my jacket, I hear the sound of a motorcycle being dropped. I ran outside and saw my mom’s bike on its side. We got it back up and saw the beautiful dent in the sidecase from the rocks that it landed on. We sat and ate some food brought to us by a very nice lady and her daughter. We stayed at this place for 3 nights and during those nights, we met some people from South Africa also on BMW motorcycles that were going north from Argentina. We gave each other our cards and later that night we met up for pizza and a drink. That night I was up at around midnight and the dogs were going crazy outside. I went to the bathroom window to see what was going on, and two of the dogs came to the window and just stared at me like they wanted to play. I went back to sleep and thought it can wait till the morning. I woke up the next morning and saw one of the dogs in a box lying down and looked closer… I saw 3 puppies! The dog had 3 puppies last night, and that was the dogs we barking about. 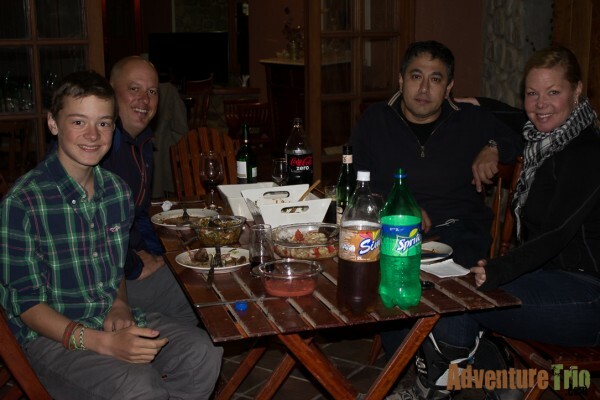 We left the next day and continued into the town of Huaraz where we stayed for the night and walked around the plaza and got dinner in a nice quiet part of town. As we were walking back to our hotel, this dog came trotting up. When we started scratching him, he let out this happy sound like he was in heaven. He follow us two-thirds the way back to our hotel until he found a smell and walked away. Everyone was heartbroken by the dog that night because we wanted to take him home, but there is no room on the bike. Haha! The next day, we made our way towards the town of Huanuco where from there we would make our way to Lima. We left Huanuco at 8:00am and got to our rental apartment at 8:30pm, meaning we were on Lima’s main freeway at 8:00 at night where all of the crazy drivers are out and about. We stayed in this apartment for a week while we got A LOT of work done and spend a lot of time touring the city. 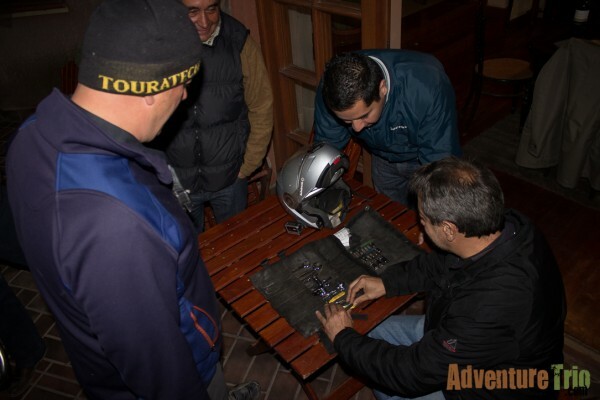 We also visited Touratech in Lima and had both rear tires changed because there was almost no rubber left on them. After we departed Lima, we headed back to the mountains and are following the Andes to Cusco, Peru, where we will make our plans for Bolivia. 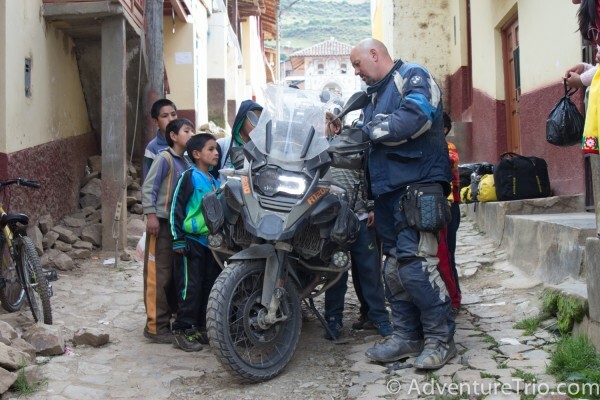 We are now in the town of Ayacucho, Peru, where we met up a friend that we met in northern Peru and who is also on a trip on a BMW F800 GS, and we are going to ride to Cusco together. Well this concludes this edition of Jack’s Chat. Check back soon for another article. Make sure to visit often for more pictures and updates. We headed south from San Jose, Costa Rica, and stayed two nights on the Caribbean Ocean beach in a very expensive hotel. Well, the second night we had to camp in the grass parking area next to the hotel as the rooms were way over our budget. And, it rained all night. 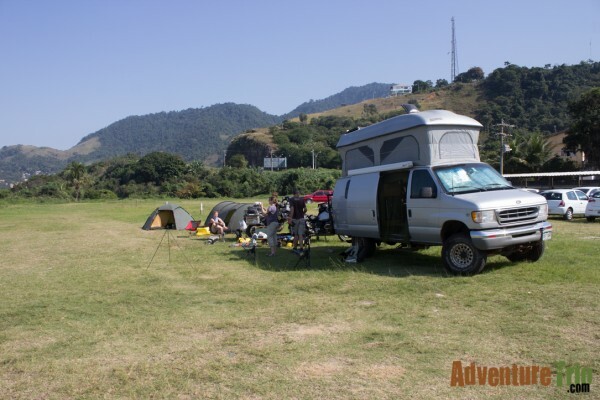 The next morning, we packed up sopping wet tents and we were off to cross into Panama. The border crossing into Panama was a lot smoother than all of the other border crossings in Central America, each averaging around 4 hours. This border topped out at about 2 hours with off and on rain showers. Once we had gotten everything done at the border, we met some other motorcycle riders that were riding in the same direction as we were. And, one of the riders on the other bikes was wearing sandals in freezing temperatures and didn’t seem to mind. We got out of the mountains and into some lower altitude where it finally warmed up. By the time we rolled into the hostel, it was freezing again and we had to set up our tents that were still all wet from the beach. 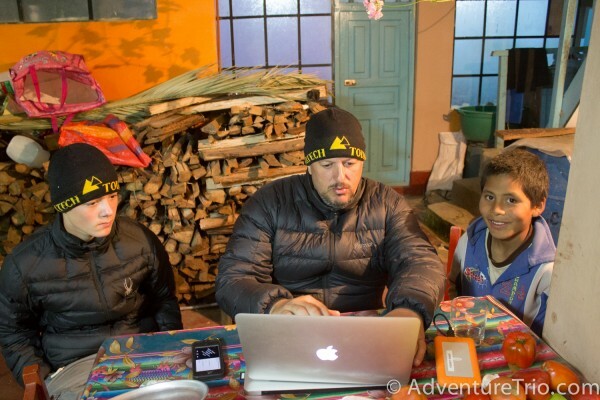 Once we got our tents up, we went into the hostel common area and got some tea going to warm ourselves up. That night we all slept very well because we were exhausted from the day before. We all got ourselves ready and had some breakfast and chatted with some of the people in the hostel. We were lucky enough to have a room our last night there so that we didn’t have to pack up our wet tents the morning that we had to leave. Once we had left the hostel, we were on our way to go to Panama City and stay with our friend, Alison, and her boyfriend, Carlos. We got there, got settled into our room and had some lunch. We stayed there for a couple of days while we got all of our papers ready for the ferry ride from Colon to Cartagena. 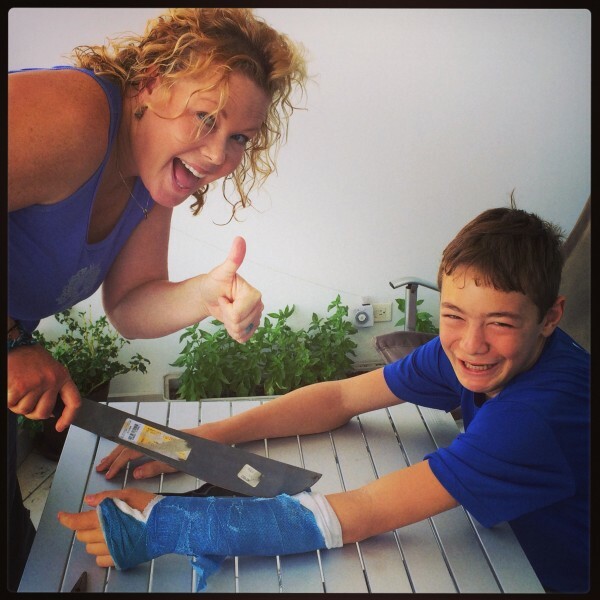 While we were there, we also called around to some medical clinics and hospitals to see who could remove my cast. They all said either “No, we don’t do that” or said that they would transfer me to another clinic down the road. Well, they did transfer me, but nobody answered. Then we started considering to just taking it off ourselves. And, that’s what we ended up doing…with a hacksaw…and, a Leatherman multitool. We got it off by cutting, prying, and moving it around. Finally off, I got my arm rinsed off with water, and it felt so good. But, the one thing that I couldn’t do was move my wrist. The muscles were so tense and bunched up from not moving I couldn’t move my whole wrist. I spend the next 3 days moving it and stretching it. The day we had to leave for the ferry dock, we packed up early and were off to Colon to catch the ferry. After 5 hours of waiting and getting papers stamped and turned in, we finally got the bikes on and got our gear off. We went up to the top deck to hang out with some people we met at the customs office and sat up there while the boat pulled away from the port. About 1-2 hours later, we were out in open ocean. The boat rocked and rocked and rocked. My mom and I ended up putting on patches to keep us from vomiting. That night was an interesting sleep. We woke up to the boat going forwards and then backwards. I could barely stand. Once it was morning and got food, we were told that we hade to vacate our room 2 hours before the boat got into port so that they could clean. So we moved all of our stuff into the bar area that had nobody in it, and sat there for an hour and a half working and checking social media. They finally let us go and get the bikes ready to get off of the boat. Once we got off, we walked up to the customs to get ourselves into the country. Then, my parents had to go and get the inspection done on the bikes. The inspection took about an hour and a half. That night, we attempted to go to an Air B&b house that we had reserved. The owner had met us at the gas station across the street from the port on his bicycle and was going to lead us to the house. We went about 2 kilometers and we stopped at a “hotel” that he said he owned and asked us if we wanted to stay there or if we wanted to go to the other house. We told him the other house because we wanted to have the place that we had already paid for that had a kitchen and private rooms. He put his bike away and asked my mom if he could ride on the back her bike to the house. She proceeded to say no because the passenger seat was filled with a duffle bag. He flagged down a taxi and told the driver where to go. We followed them through some “ok” traffic and through this very sketchy street that lead to the house. We took one look at the house and at the neighborhood and asked him if the neighborhood was safe. He then asked us if we were going to go out after we got settled in, implying that it wasn’t safe. My parents and I talked and decided to not stay here and to go and find a hotel. We looked at a couple of hotels and they all were $200 or more. We finally found one that we were able to get for a good price. We stayed there for two nights and got a lot of work done. The next day we went to some cities that were along the beach and that brought us inland. Yesterday we got to this awesome camping spot that has a bunch of animals and ponds with a lot of land. We plan to be here until tomorrow and then make our way to Medellin to stay with some family we have there. That concludes this edition of Jack’s Chat, make sure to check back soon for the next one. Hey everybody, I know that I haven’t been writing on my chat corner at all lately, but I am going to change that. I am going to be writing an update every week now. So make sure to come back and check it out. So lately we have been walking around and checking out this awesome city by the name of San Jose Costa Rica. The reason behind us being here for so long has been due to me breaking my wrist. The night before the incident we had pulled into a hotel and camping place that we were originally going to camp at, but due to it raining and there being almost no daylight left because the road in was slow and slippery, we kindly asked, “Is there a chance that you have a room for tonight?” After we got unloaded and had some dinner we got into bed and went to sleep. The next morning just as I was waking up, I realized that I was falling. But not from a regular bed, but from a 6’5 foot bunk bed. My parents came into where my bed was screaming my name and laying me down. Once I was fully awake, I looked at the spot that was hurting, and saw that my wrist didn’t look right AT ALL!!! It looked like I pulled my wrist and out, turned it, then shoved it back in, while at the same time breaking a bone. I was moved onto the bigger bed and laid there with ice while my mom made me a splint using a book and a bandage wrap. My dad went to go wake up the hotel owner to call a taxi to the medial clinic because the day before we had crossed into Costa Rica and hadn’t gotten a sim card for this country yet. We had found out that no clinic in town had an X-Ray machine to see what happened to my wrist. We found a clinic that had an ambulance to transport me to a San Jose hospital. The people were nice enough to take all of our gear to the hospital. My dad followed on the 800 GS to be able to take at least take one bike to the hospital with us. Once we got to the hospital, I was put into a wheelchair and rolled into the doctor’s office so he could take a look at my arm. My dad went and parked the bike at a garage down the street. We put all of our gear in a cart and brought it up to our room. I got settled into my bed. I was scheduled for surgery at 4:00 P.M. that day to get my wrist set. The nurses came in about a half an hour before surgery to put me into my hospital gown….that was awkward. Once the surgeons assistant came in to move by bed into the surgery room, they moved me onto the surgery be and put the mask on my mouth to have me go to sleep. I woke up to them carting me back to post-op and was in a lot of pain. I sat there for an hour with an unbelievable pain in my bicep. All the doctor did was put two medicines in my IV and give me a shot. I finally left post-op and was back in my room. I was able to eat and drink in 3 hours, and passed the time watching the FC Barcelona game (GO MESSI!!!!!) and checking Facebook. A lady came in and gave me a whole plate of food. The plate was empty in about 2 minutes… That night, my dad took a ride back with the ambulance to Monte Verde where the 1200 GS was. He spent the night in our hotel room that we had reserved for another night, and returned on the other bike in the morning. That morning I was brought some cereal and fruit for breakfast, and was adjusting to having a cast. I called the nurse to undo my IV so I could shower. I was helped into the bathroom and had a bright orange biohazard bag on my arm to keep the water out. I had a nice hot shower and got my self ready for the day. I was all good for the day, and all I had to wait for was the ok from the doctor to leave. The doctor came in, asked my how I felt, and told me I was good to go. The nurse came and took out my IV and I was wheeled out to the car ramp. Fortunately, our friend said that her brother in law had a house in a town 8 miles from San Jose. He came to pick us up and bring us to his house and got us all settled in. We have been at his house for about a week and a half and will be for another week and half. Well that concludes this edition of Jack’s Chat, I hope you guys like it and if you have any questions, please leave comments below. Hey guys it’s me Jack, I so sorry for not catching up on my chat corner I have been so busy it totally slipped my mind. So right now I am actually an the Progressive International Motorcycle Show in Long Beach California witch has like all of the motorcycle dealers that you could ever imagine showing of their new bikes for 2013. and let me tell you that the next time you go on a road trip, MAKE SURE TO TAKE A NAP. Its was like a 6 and a half hour ride from Davis and we ended up eating dinner at like 11:30 P.M. Ugh. Well that’s it for this edition of Jack Chat and be sure to leave me some comments and questions in the comment area below. Hey everybody I’m back, sorry i have not been catching up on my chat corner. Today we went on a scenic raft tour and then we went whitewater rafting on the snake river in Jackson, Wyoming and got really wet. Yesterday I met some kids and was hanging out all day long in the pool, and this morning they had to leave to go back to Baton Rouge Louisiana so it kinda bummed me out that they had to leave but the rafting really made me happy. But I’m going to keep in touch with them for sure. Make sure to come back next Wednesday because thats the day before the end of our trip. You must be getting excited about your summer vacation. 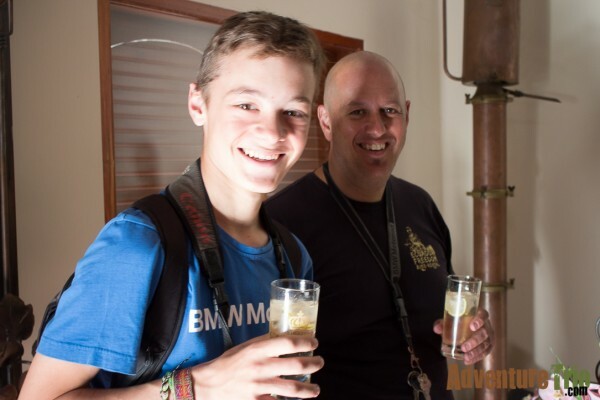 Keep us up to date on all of your adventures and take lot;s of pictures for us. Hope to see you in Cambria this fall at the Horizon’s Unlimited Meeting. Sounds like you are having a lot of fun! Was this your first time rafting? Yea it was my first time. Hey Justin thanks for doing everything with our website and posting my latest chat. Not a problem Jack! Love your family’s site and am proud to be a part of it! Ha Ha,sorry hank isn’t here i know you want to see him so bad spirit. Hey everybody i am preparing for my final days on the road, its gonna be sad when we get home. Hey everybody. Tomorrow marks 1 month on the road I am so stoked for it being one month already. Hey everybody. Tomorrow is the last day of our trip so stoked to see friends but sad to leave the road. Hey Jack, how did Christmas treat you? Anything good? It went really good I got some really cool outdoor stuff. Hey guys. I am so stoked about our summer trip, oh by the way i loved Baja. Hey everybody I got a new motorcycle and I can’t wait to on the dirt with it. Be sure to check in every week to see if we have posted anything. Jack, Jack, Jack! Thanks for the update and Jonathan and I are soooo glad you are okay. So glad to hear the story behind all this. We thought your dad threw you off the bike or something, hahahaha! Not really. Love and hugs from San Diego and Baja. Carla and Jonathan. Jack, Jack, Jack! Thanks for the update and Jonathan and I are soooo happy you are okay. So glad to hear the story behind all this. We thought your dad threw you off the bike or something, hahahaha! Not really. Love and hugs from San Diego and Baja. Carla and Jonathan. Hi Jack, I’m so happy for you that you have such interesting life experiences as a youth. What a ride eh?!! I livednext door to your grandparents when your mom was growing up. It’s good to hear stories in “your voice”.